Japanese barberry (Berberis thunbergii) on the old O’Loughlin property, April 29, 2011. Japanese barberry (Berberis thunbergii), a common ornamental shrub, is also fairly common in wooded areas of the Federal Farm and Gully Road properties. It is ranked #4 in invasiveness for the Northeastern area by the US Forest Service, and is on the New York DEC’s list of prohibited species. So “no person shall sell, import, purchase, transport, introduce or propagate” Japanese barberry or “knowingly possess with the intent to” do those things. 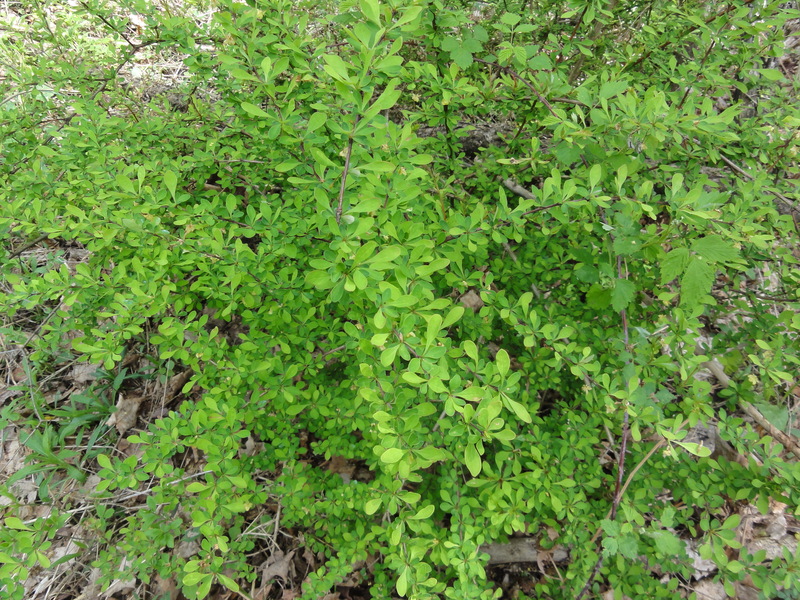 Besides the usual litany of problems ascribed to invasive plants, Japanese barberry is thought to provide an especially good environment for blacklegged (“deer”) ticks (Ixodes scapularis), which can carry a number of harmful microbes, including Borrelia burgdorferi (the bacteria that cause Lyme disease). Barberry isn’t as prevalent at the Conservation Area as some of the other invasives, but it’s not hard to find. It’s most noticeable in more heavily-wooded undersories. Japanese barberry (Berberis thunbergii) at the Skaneateles Conservation Area, May 3, 2012. US Forest Service – Northeastern Area. Forest health protection: Top Invasive Plant Species for the Northeastern Area. 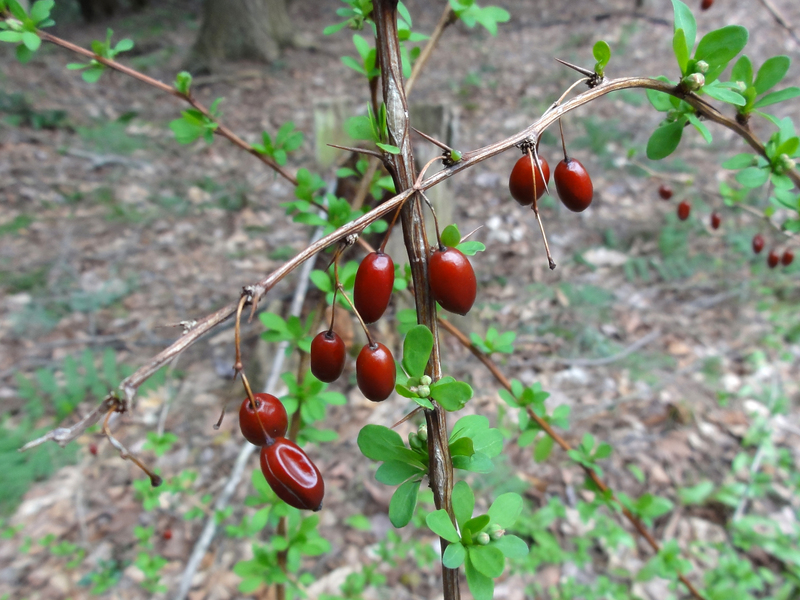 Debbie Roberts (2013) “More Findings on the Link Between Japanese Barberry and Lyme Disease.” Native Plants and Wildlife Gardens. 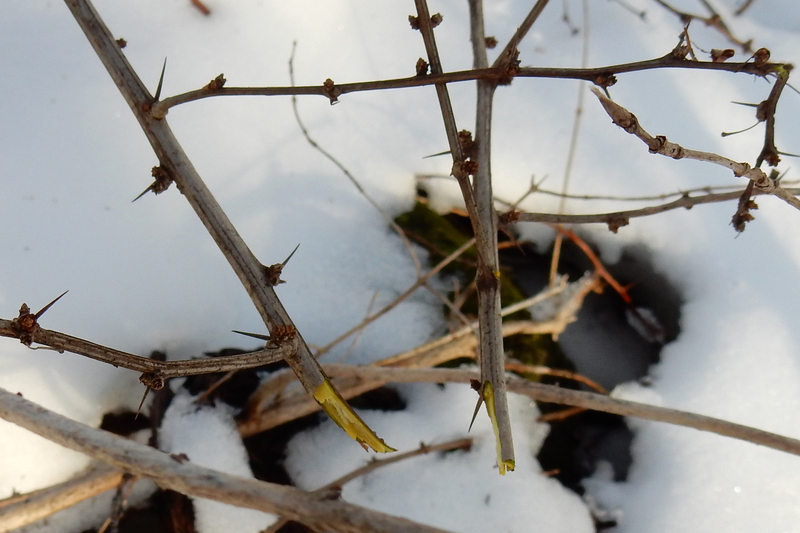 Japanese barberry near the southeast corner of the Federal Farm, Dec. 22, 2014. Note the yellow wood where the stem has been broken.